.hack//sign is about a kid who cannot log out of a vitrual reality computer simulation game. The entire series is about people he meets, who try to help him log of the 'world'. In the process they discuss, cuss, discuss some more, cuss some more, more people get involve, who discuss, cuss and discuss more about the main character. If you want action, then the entire series can be condensed into 2 episodes. It is very slow, though it is very thought provoking. Animation - Very bright!! I mean it, it is bright colored, which gives it an effect of always watching a computer screen, when it shows shots of the real world, it is dark and menacing, very cool. There was a lot of repeat cells though, which became kind of annoying seeing the same things over and over again. Overall though, it is really nice and I enjoyed it. Plot - Well the plot is simple, Tsukasa needs to log off. In the proces they discuss it in every episode. It is like Tolkien giving extreme detail to one thing, beautiful and brilliant, but if you are not in the mood for a slowed paced show, then you won't like it. Humor - Lame, the main character is almost Nihilistic. While I am into type of things like that, it seemed inappropriate for the anime at hand. There really wasn't much humor in here anyway. Don't watch this if you want comedy, ouch time!! Sound Track - The best part of the anime in my opinion. While the music overpowered the show in the first two episodes, it still fit in nicely with the rest of the anime and is a pleasant treat for anyone who like a good sound track. Overall this is recomended to people who want to sit back and listen and think about the anime as a whole. I really enjoyed this anime, even as many review websites crush it; but then again, I don't exactly follow the grain. The sound track is recomended to all who like good music. The soundtrack is incredibly beautiful, beyond ordinary background music. The anime is way beyond ordinary anyways. It is not out of this world, but it is at the same time. I looooooooooooved the show it was ammazing. 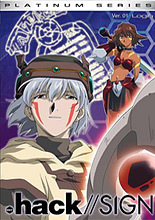 There are no words to discribe .hack // sign ! For every one! This is one of the best Animes I have ever Seen, I am not sure if any one feels the same but the animation is beutiful and it may have the best sound track sinse cowboy bebop. The world is large, creative and magnificent. The story is original and it stands out from many of the lesser animes (cough cough *DBZ* and many others cough cough). This show is brilliant and you really get to know who the charatcers are. I give this show a 10 out of 10 and lowest i would give it a 9 out of 10!! !